It rained most of last night and by the time that I got up this morning it was still raining and was turning into hail, snow grains, rain and some snow flakes.....decided to put off my final 22 Long run until tomorrow and do a short run and follow it up with a workout at the gym.....that's spring time in Utah. "IMPROVISE, ADAPT & OVERCOME"
Good decision! We had a lot of rain and heavy winds the last weeks. Now that it is sunny, running is much more fun! Hope you feel the sun also very soon! 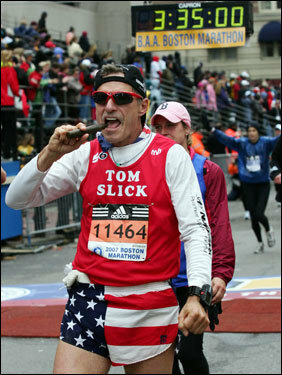 Yo, Bro Slick--I am not running Boston this year. In fact, I just deferred a race entry for next month since I'm trying to resolve a piriformis issue I've had for a few months. Just got a steroid shot a couple of weeks ago, and am on prescription med hoping it all works out. Good luck to you, amigo! Good to hear from you Bro-Pro, Get well as soon as possible and be sure to keep the Coms channels open and functional!!! !